An interesting read, found this via a Curry Hitchborn tweet and a UBC retweet. Here are some of the salient points and a link to the full article. How Trickle Down Sport is Delivered Around the World and Why it Fails Grass-Roots Sport. This is the way National Sporting Organizations and Government Sporting bodies have tried to lead sport for the last few decades. When you think about it, is there any real doubt as to why Trickle Down sport has failed? 6 The stakeholders then go back to their States or Regions or Districts or Clubs (depending on sporting system) and “sell” the new national program to the “end-users” of their sport, e.g. Club administrators, athletes, coaches, parents, officials etc. STOP HERE for a moment and just think…..think about the logic of this typical Trickle Down Sport management model in light of what we’re seeing right now in sport around the world. It doesn’t make any sense to maintain our commitment to this antiquated method of leading, managing and changing sport. The World School 7s kicks off on Friday (Thursday in Canada) with the Canada team playing NZ Maori at 7:06pm local time so 10:06pm PT. The video below is an interview with some of the Canada players. 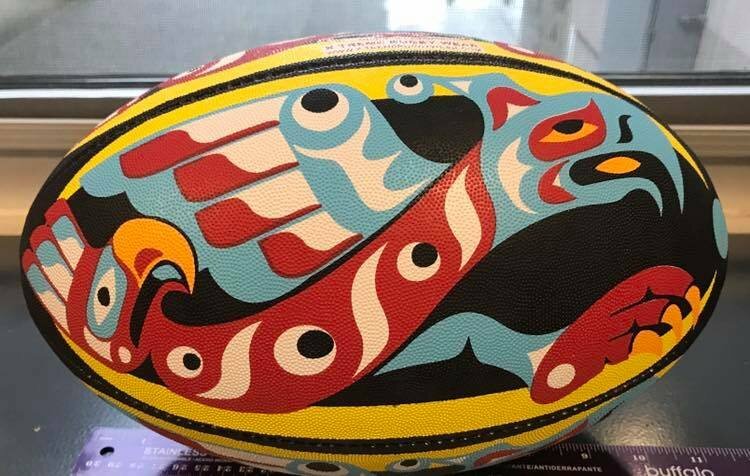 Check out the new Thunder rugby ball designed by famous Kwakwaka'wakw artist Richard Hunt. They are offering some for sale to help with the cost of getting their four youth teams over to the Vancouver Rugby Festival in March and then attending the Canada Sevens. You can contact John Lyall, jlyall@thunderrugby.ca if you're interested. The artist's comment on the design, "Here Thunderbird rides a comet coming to Earth"